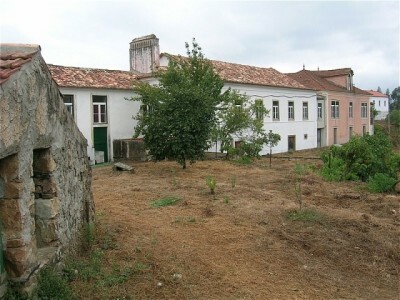 A substantial 11 bedroom period manor house for sale near Cernache do Bonjardim, central Portugal. The manor house, which dates back to the 19th Century, measures 1,089 square metres of construction and is set on a plot measuring 10,000 square metres. The property, which is connected to both mains water and electricity, is situated in an elevated position and has good views across the valley. The manor house is in a reasonable condition given it’s age and also benefits from having a borehole on the land, complete with an irrigation system for watering the gardens. The manor house has stone window and door surrounds and the windows and frames are wooden. All of the interior doors and frames are wooden and there are in a good condition for their age. The majority of these internal doors are double opening with glazed panels above. The property also has a good deal of hand painted murals and Tromp d’oeil within the formal rooms, traditional for the era of the property. The manor house is ideal for some one looking to run a historic style bed and breakfast and already has a tourism project approved from the Director General of Tourism in Portugal. The windows of the manor house are aluminium framed and were replaced recently, taking care to blend with the original character of the property. The decorative wooden ceilings of the property are exotic hard wood and are all in good condition. The property, which is set over two floors, is filled with character features though the current owners have made some improvements to the property including the installation of two modern bathrooms. The property is easy to located and is only five kilometres drive from Castelo do Bode lake, Portugal’s second largest reservoir, which is popular for all kinds of water sport activities. The closest airport to the property is situated at Lisbon, which is around two hours drive.